(i) If 20 people liked classical music, how many young people were surveyed? (ii) Which type of music is liked by the maximum number of people? (iii) If a cassette company were to make 1000 CD’s, how many of each type would they make? Sol. (i) It can be seen from the pie chart that the number of people who like class music is 10%. Hence, this 10% represents 20 people. Hence, 200 young people were surveyed. 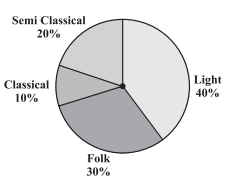 (ii) ) It can be seen from the pie chart that light music is liked by the maximum number of people which forms 40% of all the type of music. 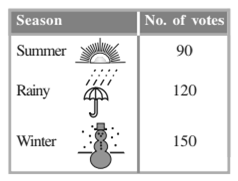 Q.2 A group of 360 people were asked to vote for their favourite season from the three seasons rainy, winter and summer. (i) Which season got the most votes? (ii) Find the central angle of each sector. 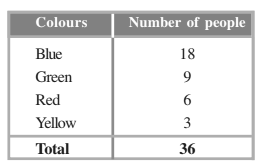 (iii) Draw a pie chart to show this information Sol. 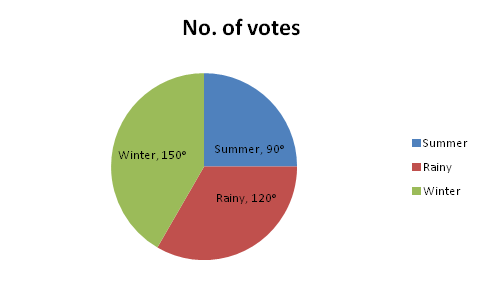 (i) Winter season got the most votes. Q.4 The adjoining pie chart gives the marks scored in an examination by a student in Hindi, English, Mathematics, Social Science and Science. If the total marks obtained by the students were 540, answer the following questions. (ii) How many more marks were obtained by the student in Mathematics than in Hindi? 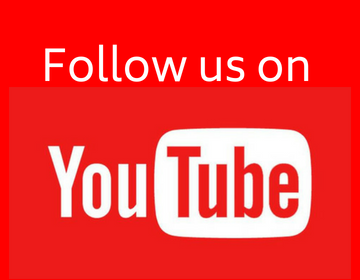 (iii) Examine whether the sum of the marks obtained in Social Science and Mathematics is more than that in Science and Hindi. (Hint: Just study the central angles). Sol. (i) Here, total marks are 540 which represents 360ᵒ. 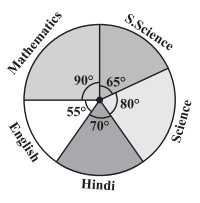 It can be seen from the pie-chart that, Hindi is the subject having central angle as . Hence, the students scored 105 marks in Hindi. Hence, 30 more marks were obtained by the student in Mathematics than in Hindi. Here, the sum of the central angles of Social Science and Mathematics is more than that in Science and Hindi. Hence, the sum of the marks obtained in Social Science and Mathematics is more than that in Science and Hindi. 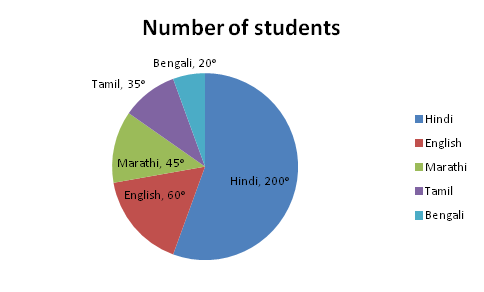 Q.5 The number of students in a hostel, speaking different languages is given below. 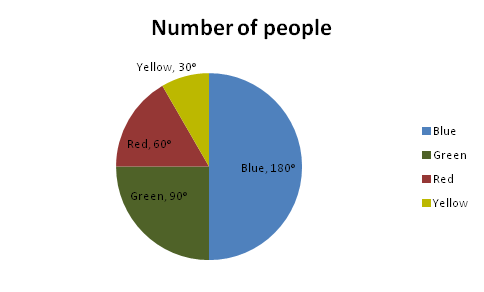 Display the data in a pie chart.